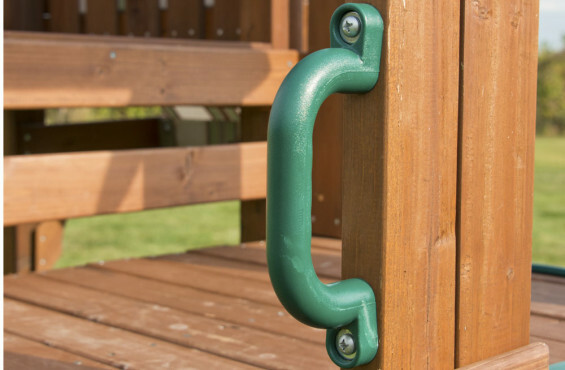 Our safety handles feature an easy grip handle that securely mounts to your swing set for added safety. Your child will use the safety handles to hoist themselves up onto various platforms. These swing set safety handles are sold in pairs and include mounting hardware. Constructed with durable polyethylene, they're designed for use on all standard and custom designed swing sets. We recommend adding safety handles on both sides of the rails around the play deck and slide entrance. They also are a perfect safety aid on ladders, rock walls and monkey bar rails. We recommend adding safety handles on both sides of the rails around the play deck and slide entrance. They also are a perfect safety aid on ladders, rock walls and monkey bar rails.